Hyperscale operators are defined as enormous companies like Amazon, Apple, Facebook and Google that need to provide computing on a massive scale. 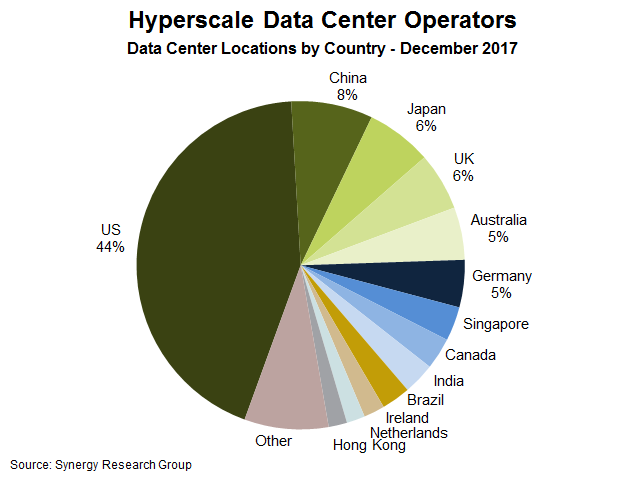 You would think that there would be a limited number of this type of highly specialized data center, but recent research from Synergy Research found that 2017 was actually a breakout year for new hyperscale data centers across the world — with no sign of slowing down in 2018. Synergy reported that the year closed with over 390 web-scale data centers worldwide, up from 300 in just one year. Google was particularly active. Chinese companies Tencent and Baidu also built hyperscale data centers this year. Still, the vast majority are in the US with 44 percent of the total. China is second way back with 8 percent, followed by Japan and the UK with 6 percent each and Australia and Germany with 5 percent each. Synergy reports that on average, the 24 hyperscale firms have 16 data centers each. The companies with the largest number won’t come as a surprise to anyone with Amazon/AWS, Microsoft, IBM and Google each having at least 45 worldwide. These operators often build their own equipment to deal with the specific needs of their immense computing requirements. By designing their own hardware and software, these companies can control every aspect of the computing experience to squeeze out the maximum amount of efficiency, which is crucial when you are dealing with the massive scale of these organizations. To do this, they need to understand and be able to manipulate every configurable element, something that is typically not possible when buying equipment off the shelf. Because of these unique demands, it limits the number of companies who build these kinds of data centers to the largest technology companies in the world. As these companies in this exclusive club continue to grow, they will continue to require additional hyperscale presence throughout the world and Synergy reports 69 additional facilities were in various stages of planning or construction, but not completed, as the year closed. At the current pace, Synergy predicts there will be over 500 worldwide by the end of 2019.